This is the Volvo hybrid truck called Mean Green. 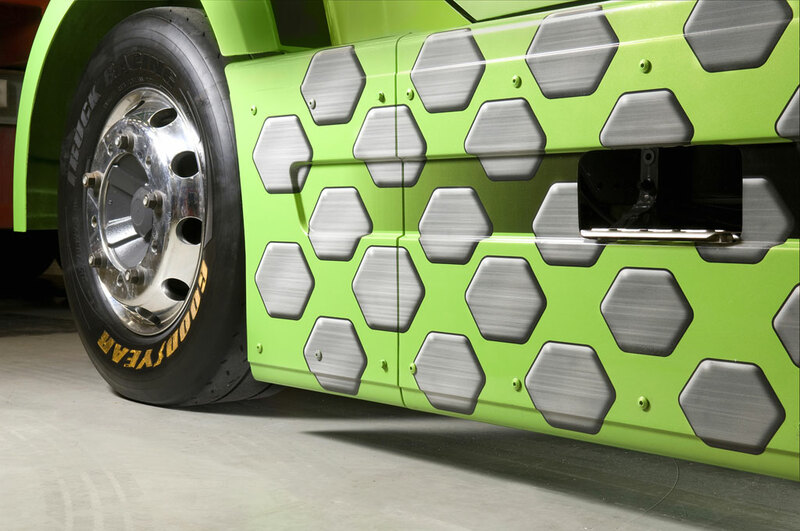 It recently broke two records at the Wendover airfield in Utah making it the fastest hybrid truck in the world. The records Mean Green broke were the measuring of speed in a short distance called the flying kilometer where it drove 147 mph. The other record was the standing kilometer where it got to 95 mph from a stand still in the shortest distance. Volvo designed the truck to reach these great speeds after many man hours dedicated to making the cab as aerodynamic as possible. The engineers at Volvo created the truck's D16 engine which is able to transition from electric to diesel. The diesel portion of the engine runs off of renewable liquid rosin and has an astounding 2100hp with 5000 pounds of torque. The electric side is far less powerful but not to shabby putting out 200 hp and 885 pounds of torque.